U.S. 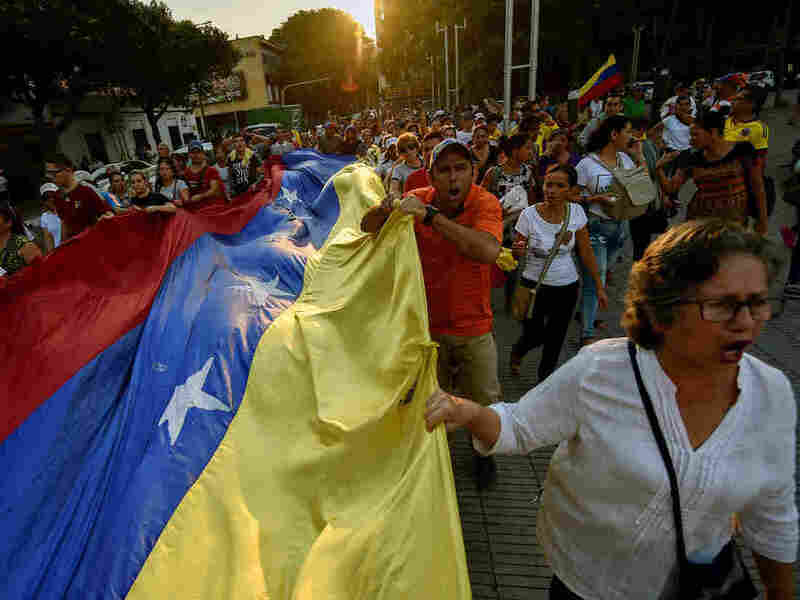 Masses Aid Along Venezuelan Border As Some Humanitarian Groups Warn Of Risks Some aid workers are being denounced as opposition activists and there are fears that all aid could be blocked. The situation could soon resemble a "medieval siege," warns an analyst in Caracas. Humanitarian operations are supposed to be neutral. That's why the International Committee of the Red Cross, United Nations agencies and other relief organizations have refused to collaborate with the U.S. and its allies in the Venezuelan opposition who are trying to force President Nicolás Maduro from power. "Humanitarian action needs to be independent of political, military or any other objectives," Stéphane Dujarric, the U.N. spokesman, told a press briefing last week in New York. "The needs of the people should lead in terms of when and how humanitarian assistance is used." "Humanitarian aid has been turned into a spectacle to justify a military intervention of our country," Maduro told a news conference in Caracas last week. Other critics have drawn parallels between the U.S. operation and Russia's intervention in eastern Ukraine in 2014, when it sent more than 250 aid trucks into the country without Red Cross escorts or customs clearance. U.S. officials acknowledge that positioning the aid on the border is, in part, designed to provoke. The idea is to convince Venezuelan military officers to defy Maduro's orders and allow the aid into the country. "Members of the army are Venezuelan citizens. ... Our hope is that they will be able to persuade Maduro, or they will simply disobey orders to continue the starvation of the people of Venezuela," Elliott Abrams, the U.S. special envoy for Venezuela, said at a State Department briefing earlier this month. Such a rebellion could lead to Maduro's ouster — an outcome that would do more than anything else to improve living conditions inside the country, says Kevin Whitaker, the U.S. ambassador to Colombia. Maduro "needs to leave so his people's needs can be attended to, so the Venezuelan economy can be put back on its feet, and so that Venezuela can once again be a normal country," Whitaker told NPR in a telephone interview. "Local NGOs have received some ... warnings because of their engagement with international aid. The whole environment is becoming more aggressive," Almeida said. Meanwhile, aid groups are bracing for a new round of U.S. sanctions that effectively block the sale of Venezuelan oil to the U.S. These proceeds make up the bulk of Venezuela's cash income, which is used to import food and medical supplies. That means rice, milk, antibiotics and other vital products could become even more scarce, says Phil Gunson, who is based in Caracas for the International Crisis Group. He says the situation could soon resemble a "medieval siege where you prevent your adversary from obtaining resources from outside the city walls." What's more, the sanctions could worsen the current shortages of gasoline and auto parts. 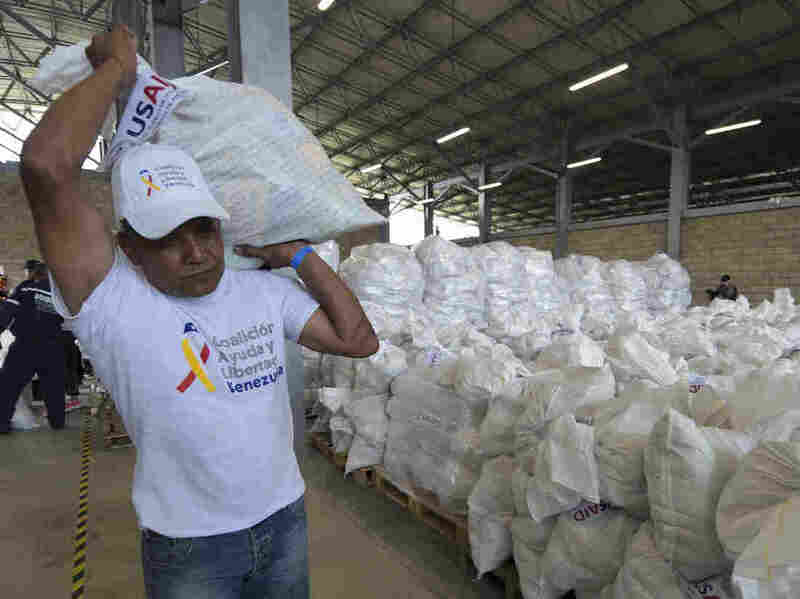 "If we can't move around due to a lack of gasoline, that means humanitarian aid cannot be mobilized," warns Feliciano Reyna, the founder of Acción Solidaria, a health and human rights group that distributes medicine to 14,000 Venezuelans. "I'm convinced that there won't be enough time for the sanctions to have an impact because the ouster of Maduro will take place before then," Olivares said during a recent visit to Cúcuta, Colombia. Whitaker, the U.S. ambassador, insists that the U.S. aid effort is "moral and ethical." By contrast, he points out that Maduro has for years funneled state food handouts to hungry Venezuelans in exchange for their support. "Our focus is on making humanitarian assistance available to the needy people of Venezuela," Whitaker said. "If anyone is politicizing this, it's Maduro." To bring more attention to the aid logjam on the border, Richard Branson, the British billionaire and philanthropist, is organizing a benefit concert in Cúcuta next Friday, Feb. 22. Branson said he hopes to raise $100 million for humanitarian aid and is taking action in response to a request from Juan Guaidó, who is recognized by the U.S. and dozens of other countries as Venezuela's interim president. The day after the concert, the Venezuelan opposition hopes to mobilize an army of volunteers to break the blockade and move the aid across the border. It's unclear how this would happen and the action could provoke a violent confrontation with Venezuelan troops. But thousands of Venezuelans have signed up online to help. Among them is Jorge Valenzuela, a retired lawyer who attended a recent anti-Maduro protest in Cúcuta. "The aid is legitimate," he says, "and we need it."